SRG’s vow to constantly innovate to bring knowledge and help aspiring therapists in the world will always be the standard in the PT-OT review scene. We pay great attention to quality to deliver unparalleled service to every one especially to aspiring Filipino therapists. Now, access to information should never be an issue. You can learn anytime and anywhere but what separates SRG from the rest is the character training that is beyond what anyone can learn from any setting. Producing two topnotchers (top 2 and top 7), the season 1 of the Webinar review for the Philippine licensure examinations was successful and due to insistent public demand, we are now ready for SEASON 2! 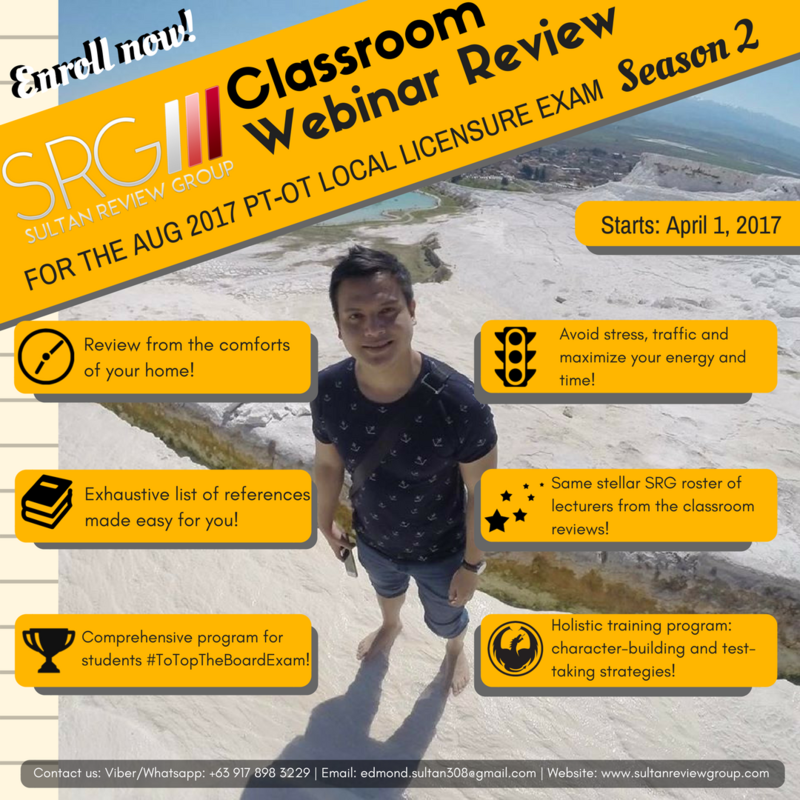 Enroll now for the August 2017 PT and OT licensure exams and be part of the Webinar revolution! We will take you to a whole new level of learning! There are really no excuses this time because if you have the will, SRG has the way! Same quality! Same lecturers! Same brand! Different medium! Next level of experience! Enroll now! Priced at 25,000 PHP (for those staying, living, and working in the Philippines) and 750 USD (for those staying, living, and working outside the Philippines).